Covers full course, especially the ones from the exam. Happy with process exam site as it has helped me clear my IIBA CCBA certification exam, Thank you. As soon as I subscribed for the mock tests, I was clearly made to understand how to give the CBAP online practice tests through simple guidelines on process exam website. 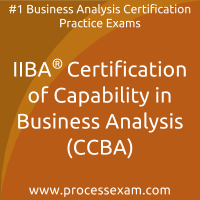 I have cleared IIBA Business Analysis Capability (CCBA) certification with good score. I would like to thank processexam.com to made me think like a professional while giving the exam. Even after being an average student, the site played a key role to increase my confidence by giving me unlimited access for 2 months to practice mock exams and arise as a winner in actual IIBA CCBA exam. I was weak in Strategy Analysis and Solution Evaluation in IIBA CCBA Certification exam but processexam.com had mock tests that helped me ace the certification exam. I searched for many resources to study for IIBA CBAP and found processexam the best among all as it has been prepared by professionals and this helped me give the mock tests and achieve my target in the actual CBAP certification exam.